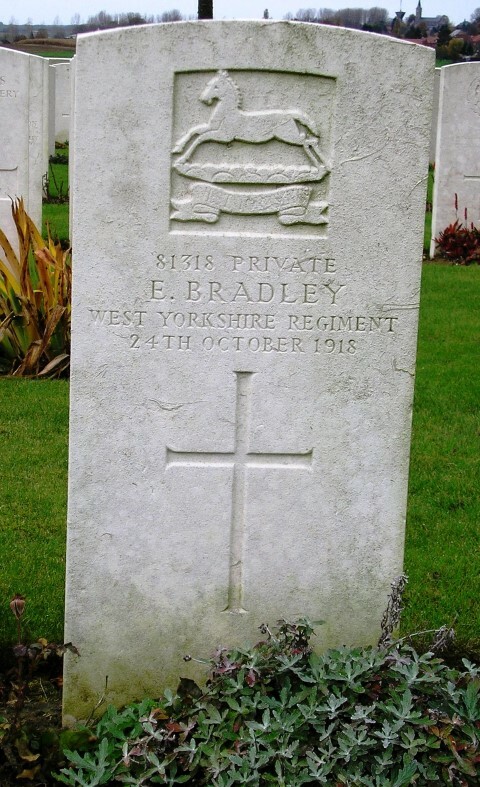 81318 Private Ebenezer Bradley, 1st Battalion, West Yorkshire Regiment (Prince of Wales’s Own) died of wounds 24 October 1918 and is buried at Premont British Cemetery. 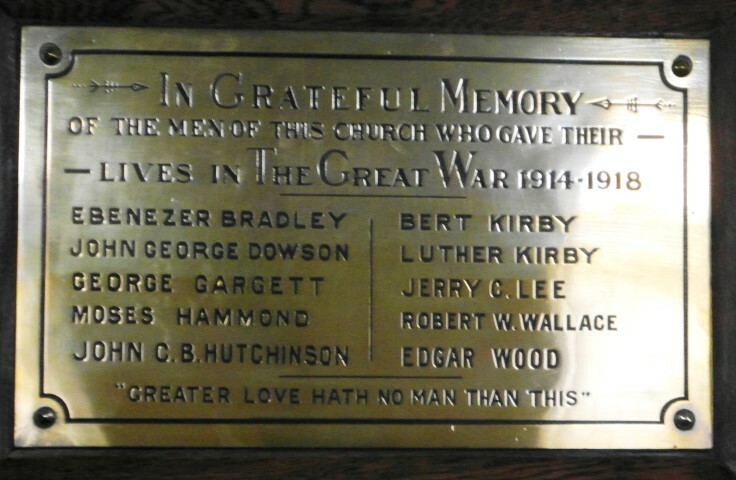 He was 25 years old and is commemorated on the Cockfield War Memorial and the Memorial Plaque in the Cockfield Methodist Church . In 1901, the family lived at Main Street and Edwin worked as a coal miner (hewer). By 1911, the family lived at Bleak Terrace, Edwin was now a deputy (coal miner), 20 year old Mary Ellen was still at home, 18 year old Ebenezer was a coal miner (putter), 12 year old Gladstone was at school as was 10 year old Edwin. By 1916, the family lived at 11 Mayfield Terrace, Cockfield and Ebenezer worked as a miner at Gordon House Colliery. By 1918, Edwin Bradley aged 18 is declared as his full blood brother and Mary Ellen as his 28 year old sister. Edwin, his father signed the declaration. 29 January 1916: attested aged 22 years 10 months into the 4th Battalion, the Northumberland Fusiliers, originally given the regimental number 78721. He was 5ft.5½” tall and weighed 122 lbs. In October 1918, the 6th Division as part of the 9th Corps, Fourth Army saw action at the Battle of Selle, 17 – 25 October 1918. 16 October: on the afternoon, the Battalion marched to about 3000 yards west of Vaux Andigny. 17 October: 1.30am marched to Vaux Andigny in preparation for an attack at 5.30am. The 18th Infantry Brigade attacked enemy positions just east of Vaux Andigny – 2/DLI on the left, 11/Essex on the right and 1/WYR in the Brigade Reserve. The attack was successful and the objective was gained with few casualties. “B” and “D” Companies were sent to “mop-up” and helped consolidate the position. 2 other ranks were killed and 8 wounded. 18 October: am the battalion relieved 2/DLI and 11/Essex in the line. 19 October: the battalion was withdrawn. 20 October: bussed from Bohain to St. Souplet and moved up to Arbre de Guise and took over the line held by the 105th and 106th Regiments, American Infantry – “C” Company on the right, “A” Company on the left, “B” Company in support and “D” Company in reserve. 21/22 October: at night the right sector of the battalion was relieved by 2/DLI – “A” and “B” Companies now in the front line, “D” in support and “C” in reserve. Orders issued that the 18th Brigade would attack the enemy’s position on the west side of the Oise et Sambre Canal in conjunction with the 1st Division on the right and the 71st Brigade on the left. The objective of the operation was to form a defensive flank to larger operations further to the north. 23 October: 01.20am, 1/WYR and 2/DLI attacked with 11/Essex in reserve. The assaulting battalions were “A” and “B” Companies with “D” company in support and “C” Company in reserve supported by 1 section, Machine Gun Company, 1 section Tank Corps and 1 Light Trench Mortar Battery. Casualties – 2 officers and 16 other ranks killed; 3 officers and 70 other ranks wounded; 16 other ranks missing. 24 October: 02.25am, the final objective was reached. During the day the battalion consolidated its position. Patrols moving forward were met with opposition “though not of a serious nature” from the villages of Ors and Le Donjon. Casualties – 2 other ranks killed; 5 other ranks wounded. During these operations 3 field guns, 2 heavy and 2 light machine guns and 4 anti-tank guns were captured along with 1 officer and 66 other ranks.